Gurusina’s traditional houses are situated around a wide courtyard, which displays several sets of ture lenggi, the ancestral stone altars. The village was founded in about 1934 by people coming from the highlands. At present, 33 families live in Gurusina, belonging to the three clans of Ago ka’e, Ago Gasi, and Kabi. 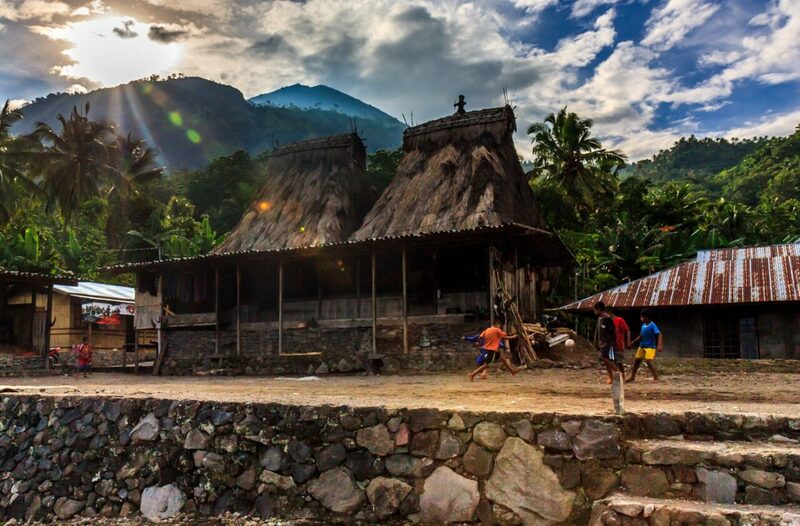 Conforming to the Ngada adat, each clan owns its own sao pu’u (original or ‘trunk’ house), a sa’o lobo (youngest or ‘tip’ house), a ngadhu, and a bhaga ancestral shrine. As in other communities across Ngada and other parts of Flores, Gurusina’s inhabitants used to be divided into three different castes. The authority of the ruling class, the ga’e, was justified by their descent from Gurusina’s original ancestors. Commoners were called ga’e kisa. At the bottom of the community stood the so’o – who used to be kind of thralls. In the past, heavy sanctions applied to women who married men of a lower status. Nowadays, the caste of so’o does not exist anymore, and the social borders of the caste system in general are almost dissolved. A visit to Gurusina can also be combined with a nice medium-impact hike starting from Bena, which leads through beautiful natural surroundings – including a neat bamboo forest – and passes through the village of Tololela. As it is easy to get lost in the forest, especially after heavy rainfalls that make the small paths hardly visible, it is highly recommended for inexperienced hikers to do this exploration with a local guide.